I Win at the Interwebs! The lovely folks over at Indy Wellness Guide have posted an article all about little old me. Plus there’s a video of me explaining why you need a garden knife. Note my awesome Wellies and totally not awesome hoodie. Should have rethought that fashion choice. But hey, at least I’m wearing earrings! Hey! I’m in the news! The Indianapolis Star published an essay I wrote in their Green Living section last Saturday. But in case it vanishes (as links are known to do in the chaos of the interwebs), I’m reposting the essay here. A lifelong city girl, I blame my fascination with farm life on a childhood “Little House on the Prairie” habit. Thanks to Laura Ingalls Wilder, I wanted to grow pumpkins, make bread, pick apples and milk cows. OK, maybe not the cows, as they’re pretty demanding, but the rest of it, yes. I wanted the farm life. Even volunteering on an organic Community Supported Agriculture farm didn’t cure me of this romantic notion — and seriously, eight hours of picking beans should knock the romance right out of anyone’s soul. Instead, it ramped up my passion for growing edibles, raising chickens, canning and other great-grandmother-type stuff (although I’m always looking to make it faster, cheaper and easier than great-granny’s way). Even though farm life beckoned, a country girl I am not. I like the city, with its theater and art and regularly scheduled trash pickup. Instead of moving to the country, I turned my roughly tenth-of-an-acre Irvington plot into an organic farmette — the Fraudulent Farmstead. I ripped out a swath of the front lawn to put in a vegetable garden, prompting neighborly chats over tomatoes, peppers and squash. I crammed baby watermelons and Halloween pumpkins into tight spots by growing them up trellises instead of along the ground. My favorite food is any kind you plant once and harvest year after year, so I added raspberries, asparagus and even dwarf apple and cherry trees. I planted strawberries between the street and the sidewalk. I had so many berries last May that I nagged passers-by to help themselves (remember, always pick from the middle of the patch, because dogs may have visited the edges). But what made my little homestead a farm was the addition of chickens. 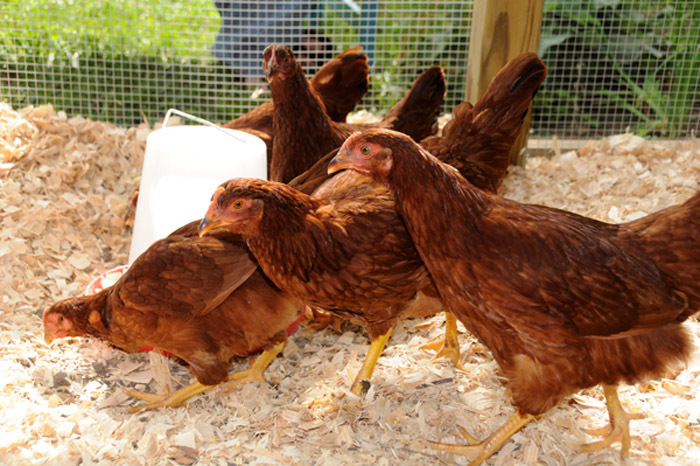 My five Rhode Island Red hens lay enough fresh eggs to share with friends and neighbors. Chickens are easy. They’re certainly less work than a dog, although not as inclined to fetch. These chickens are minor neighborhood celebrities. People stop by when walking their dogs or bring their grandchildren by to visit “the girls” at the garage henhouse. One 3-year-old even begged to help me clean out the old bedding and dump it in the compost pile. Speaking of which, chicken poop makes great compost. I use it to enrich the vegetable beds and feed the fruit trees. By putting that waste back into the soil, I complete the food cycle, growing a robust, organic garden that feeds me, my friends and family, and even the chickens. Organic gardening is cost-effective, healthy and easier than you might think. You only need some basic knowledge, a few simple tools and a sense of adventure. So this spring, take the leap. Plant a pot of strawberries to savor still warm from the sun, or help your kids poke peas in the ground and eat the pods right off the vine. Start slow, and enjoy the process. The urban farm life may soon lure you in. All of these are at Art of The Soul Center in Broad Ripple. Come on in and get ready for spring! Never planted a garden before? We’ll hit the highlights of starting your vegetable garden, including the difference between cool- and warm-season veggies, and whether to plant seeds or buy transplants. Want to make sure you buy seeds that will flourish in your garden? We’ll discuss some of my favorite seed sources, the difference between heirloom and hybrid seeds, and how to store seeds so they stay good for several seasons. By the time you leave, you’ll know exactly how to assemble your shopping list. Do you love the idea of growing your own vegetables, picking strawberries from your front yard, or collecting eggs from your own hens? Even if you’ve never planted a garden before, the Homesteading University program will give you the resources to start planning your own organic garden and urban homestead. Homesteading University covers six topics in three nights. These classes are designed to work as a unit, giving you the basics to start your homesteading adventure. The Gardener’s Toolbox: Basics of sun and wind exposure, necessary tools, the garden year, and planning your garden’s layout. Breaking Ground: Composting and soil basics, using raised vs. conventional beds, organic fertilizers, and the wonders of mulch. Wednesday, February 23, 6:30 p.m. Vegetables: Cool-season vs. warm-season vegetables, transplants vs. seeds, succession sowing, rotation, trellising techniques, and great veggies for beginners. Herbs: The most popular cooking herbs and their cultivation, herbs for other purposes, and harvesting and storing. Thursday, February 24, 6:30 p.m. Fruits: Edible landscaping, fruits for the urban farmstead, and cultivating strawberries, blueberries, bramble fruits, and tree fruits in limited space. Chickens: The role of livestock on the urban homestead, picking a breed, basic chicken anatomy, feed and housing, egg collection and storage, and converting bedding to compost.